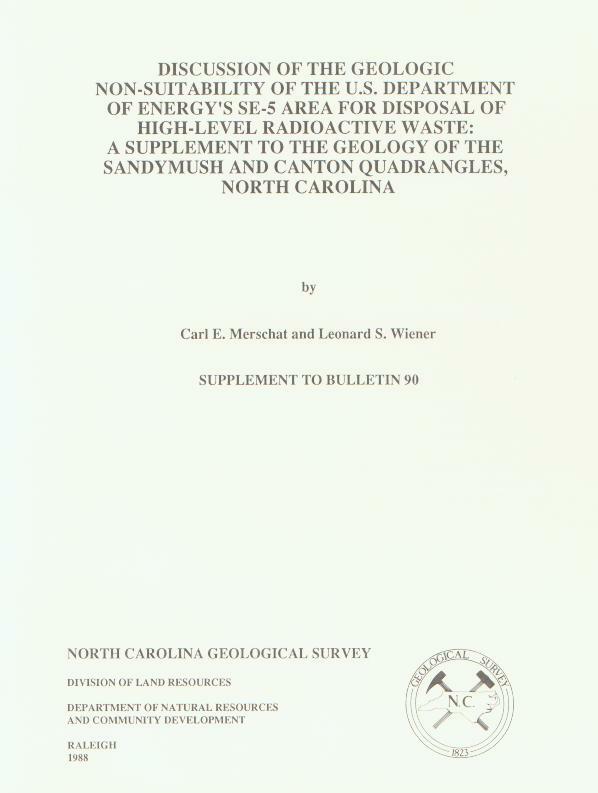 Available hard-copy North Carolina Geological Survey Bulletins are denoted below by hyperlinks to our Geological Survey Shop. All other bulletins are out-of-print and no longer available in hard-copy form. Many of these bulletins have been optically scanned, and can be obtained through the link provided or upon request, where available. Please contact michael.medina@ncdenr.gov for more information. Carter, M.W., Merschat, C.E., and WIlson, W.F. eds., 2001. A Geologic Adventure Along the Blue Ridge Parkway. North Carolina Geological Survey: Raleigh. Speer, J. Alexander. 1996. The Sims Pluton, Nash and Wilson Counties. North Carolina Geological Survey: Raleigh. Snyder, Steve, Hoffman, Charles W. and Riggs, Stan. 1994. 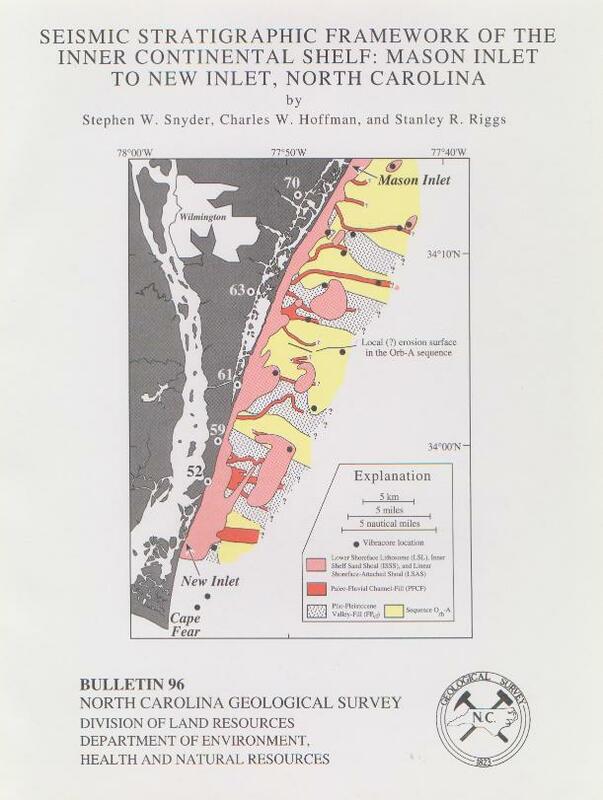 Seismic stratigraphic framework of the Inner Continential Shelf: Mason Inlet to New Inlet, NC. North Carolina Geological Survey: Raleigh. Lawrence, David, and Hoffman, Charles H. 1993. 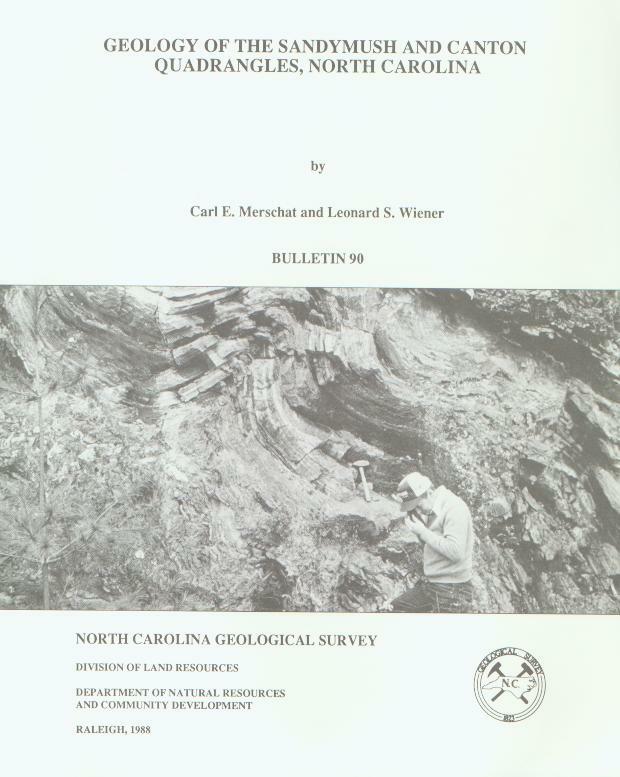 Geology of basement rocks beneath the North Carolina Coastal Plain. North Carolina Geological Survey: Raleigh. Reid, Jeffrey C. 1993. A hydrochemical atlas of North Carolina. North Carolina Geological Survey: Raleigh. This report presents, in atlas format, the concentration and distribution of geochemical constituents in domestic water wells. These data were the result of the National Uranium Resource Evaluation (NURE) program. The elements in the database are pathfinder elements to seek uranium deposits. This report is a companion to Bulletin 93 which presents stream sediment concentrations for many elements. Reid, Jeffrey C. 1991. 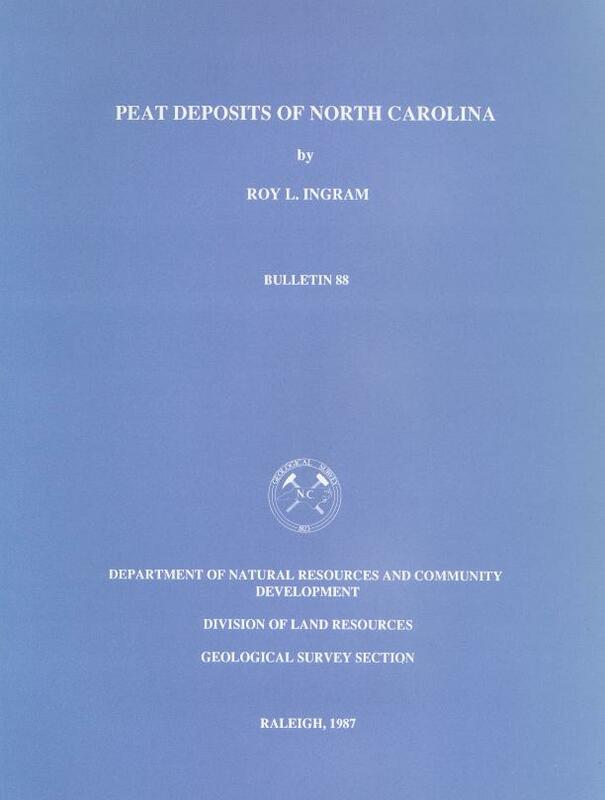 A geochemical atlas of North Carolina. North Carolina Geological Survey: Raleigh. This report presents in atlas format the concentration and distribution of geochemical constituents in stream sediments statewide. These data were the result of the National Uranium Resource Evaluation (NURE) program. The elements in the database are pathfinder elements to seek uranium deposits; subsequent analyses of these samples resulted in supplemental geochemical analyses. This report is a companion to Bulletin 94 which presents hydrochemical concentrations for many elements from domestic water supply wells. Hoffman, Charles W. and Gallagher, Patricia. 1991. 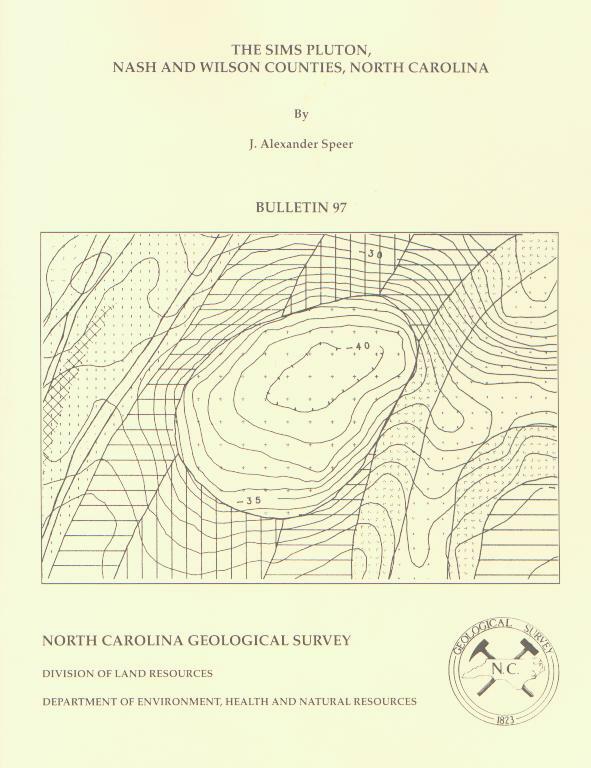 Geology of the Southeast Durham and Southwest Durham 7.5-minute quadrangles, North Carolina. North Carolina Geological Survey: Raleigh. Carpenter, P. Albert III (editor). 1991. A geologic guide to North Carolina's state parks. North Carolina Geological Survey: Raleigh. Wiener, L.S., and, Merschat, Carl E. 1988. 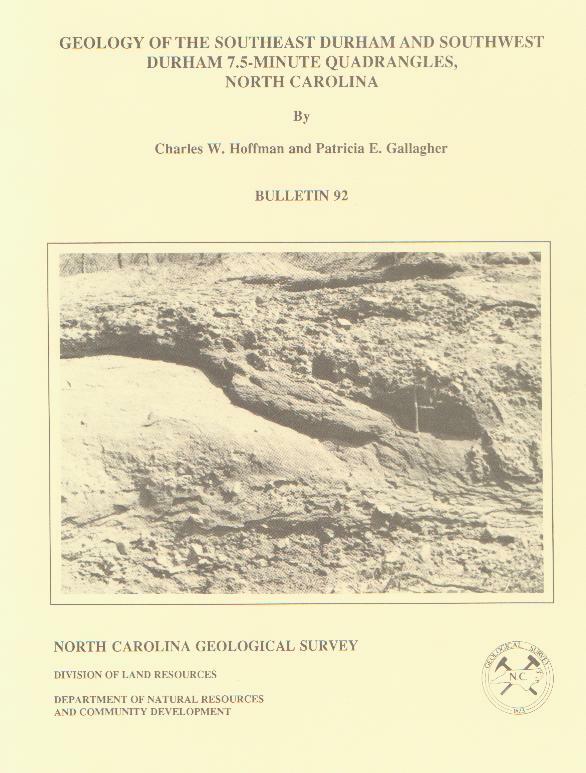 Geology of the Sandymush and Canton quadrangles, North Carolina. North Carolina Geological Survey: Raleigh. Carter, Joseph G., and others. 1988, (reprinted 1994). Fossil collecting in North Carolina. North Carolina Geological Survey: Raleigh. Ingram, Roy L. 1987. Peat deposits of North Carolina. North Carolina Geological Survey: Raleigh. Miller, James A. 1987. 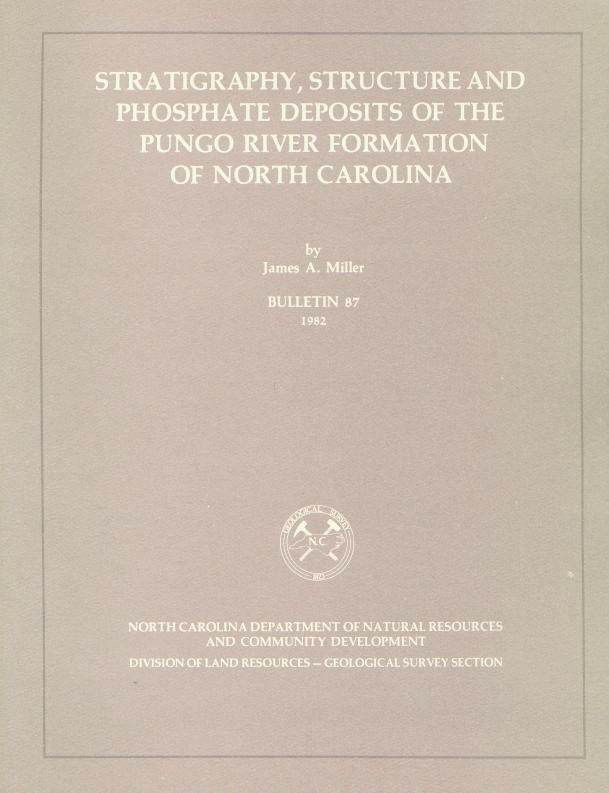 Stratigraphy, structure, and phosphate deposits of the Pungo River Formation of North Carolina. North Carolina Geological Survey: Raleigh. Parker, John M. III. 1979. 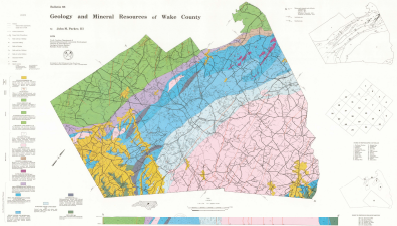 Geology and mineral resources of Wake County. North Carolina Geological Survey: Raleigh. Sampair, James L., and others. 1976. 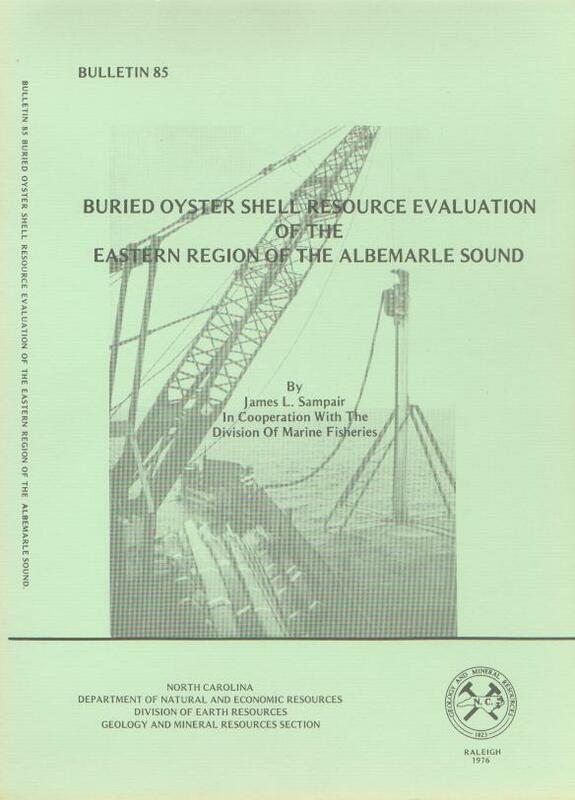 Buried oyster shell resource evaluation of the eastern region of the Albemarle Sound. North Carolina Geological Survey: Raleigh. Carpenter, P. Albert III. 1976 (reprinted 1993). Metallic mineral deposits of the Carolina Slate belt. North Carolina Geological Survey: Raleigh. Wilson, William F. 1975. 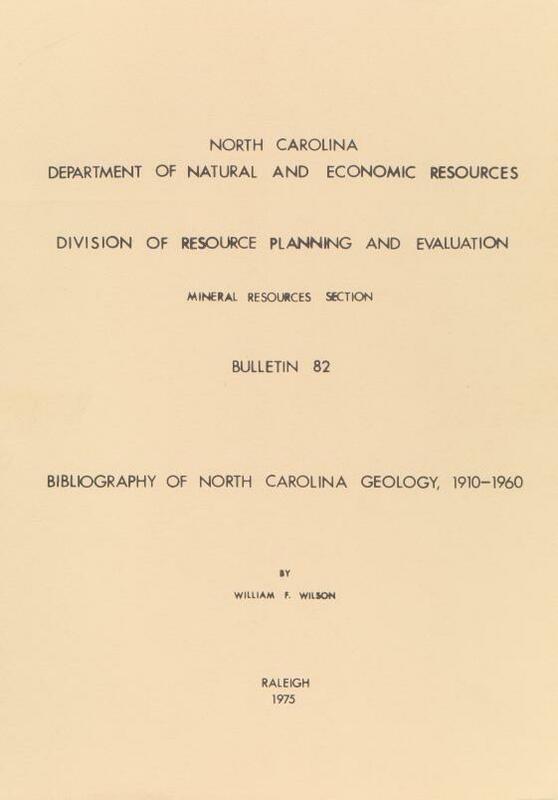 Bibliography of North Carolina Geology, 1910-1960. North Carolina Geological Survey: Raleigh. Allen, Eldon P. and Wilson, William F. 1968. 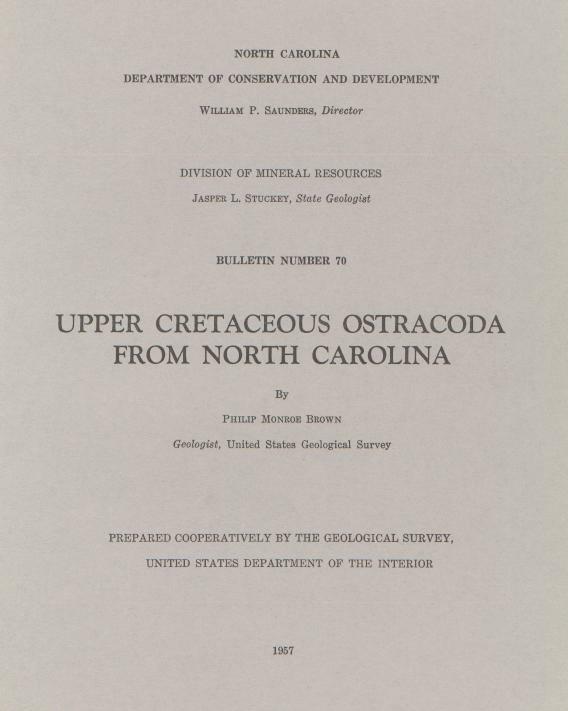 Geology and mineral resources of Orange County, North Carolina. North Carolina Geological Survey: Raleigh. Stucky, Jasper L. 1967. 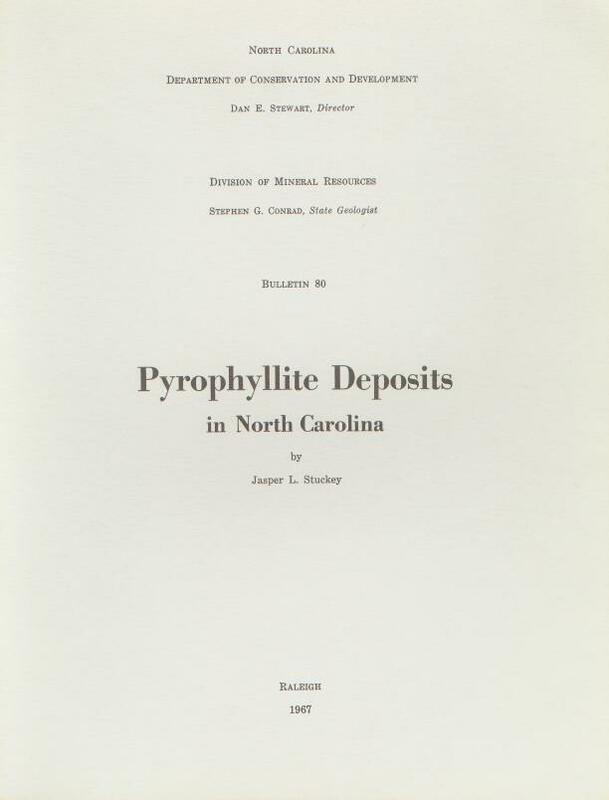 Pyrophyllite deposits in North Carolina. North Carolina Geological Survey: Raleigh. Kimrey, Joel O. 1965. 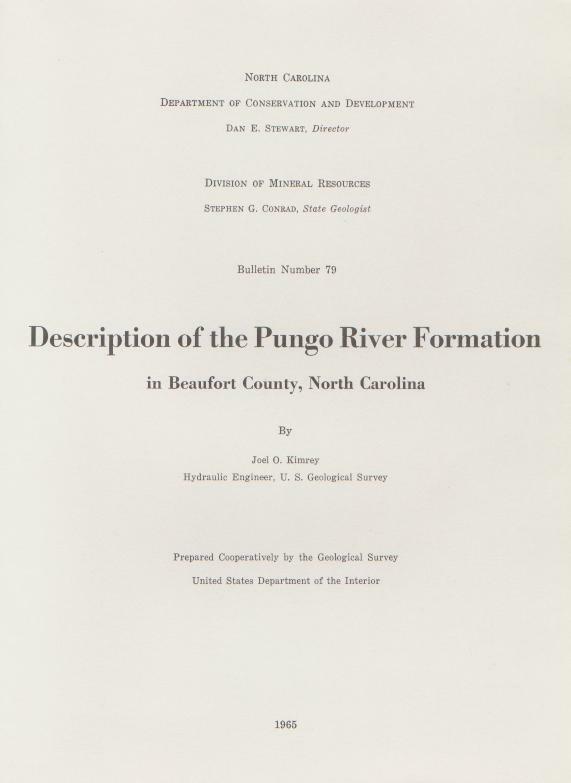 Description of the Pungo River Formation in Beaufort North Carolina Geological Survey: Raleigh. Swain, Frederick M., and Brown, Phillip M. 1964. 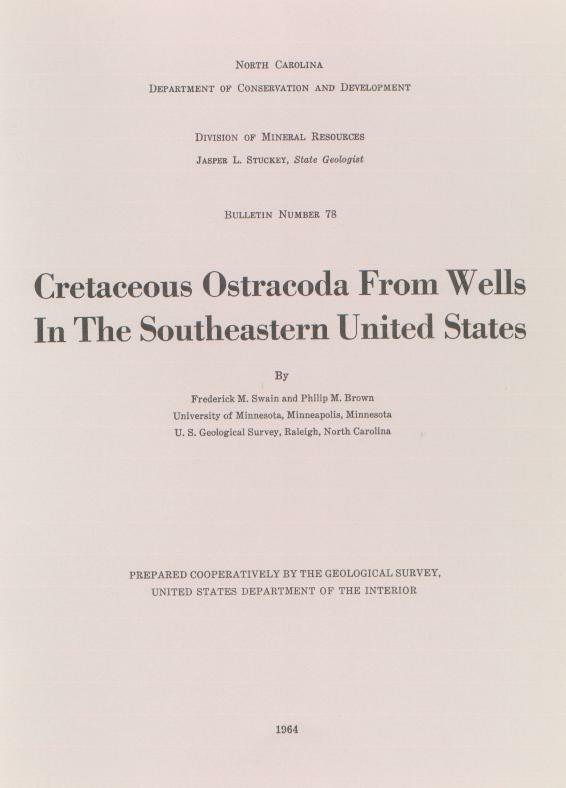 Cretaceous Ostracoda from wells in the Southeastern United States. North Carolina Geological Survey: Raleigh. Conrad, Stephen G., and others. 1963. 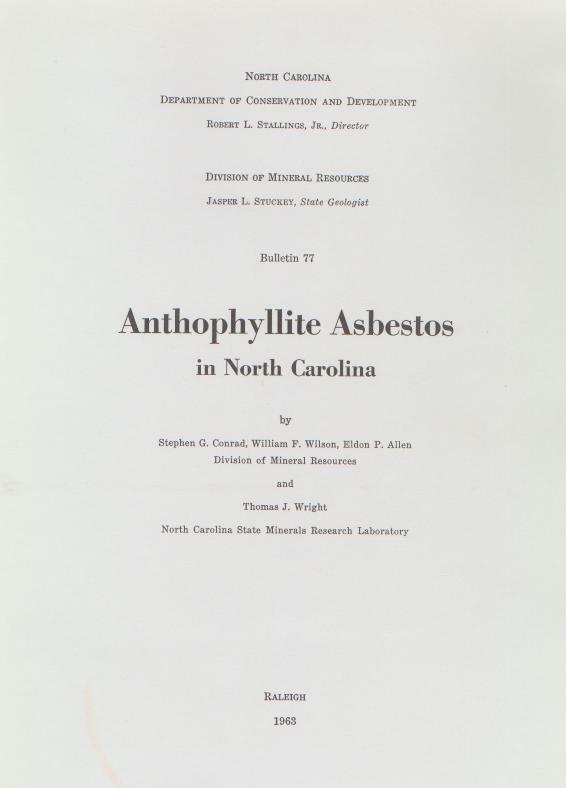 Anthophyllite asbestos in North Carolina. North Carolina Geological Survey: Raleigh. Conley, James F. 1962. 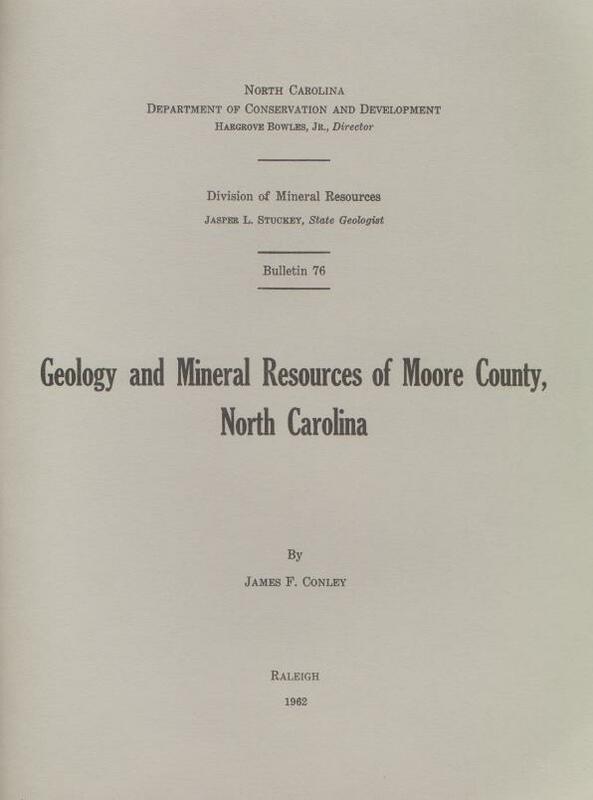 Geology and mineral resources of Moore County, NC North Carolina Geological Survey: Raleigh. Conley, James F. 1962. Geology of the Albemarle quadrangle, North Carolina. North Carolina Geological Survey: Raleigh. Conrad, Stephen G. 1960. 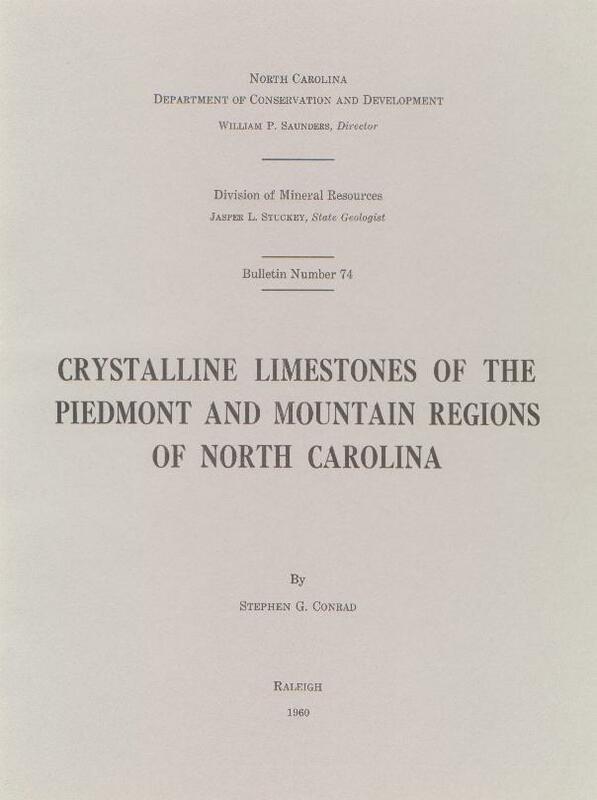 Crystalline limestones of the Piedmont and mountain regions of North Carolina. North Carolina Geological Survey: Raleigh. Stuckey, Jasper M. and Conrad, Stephen G. 1958. 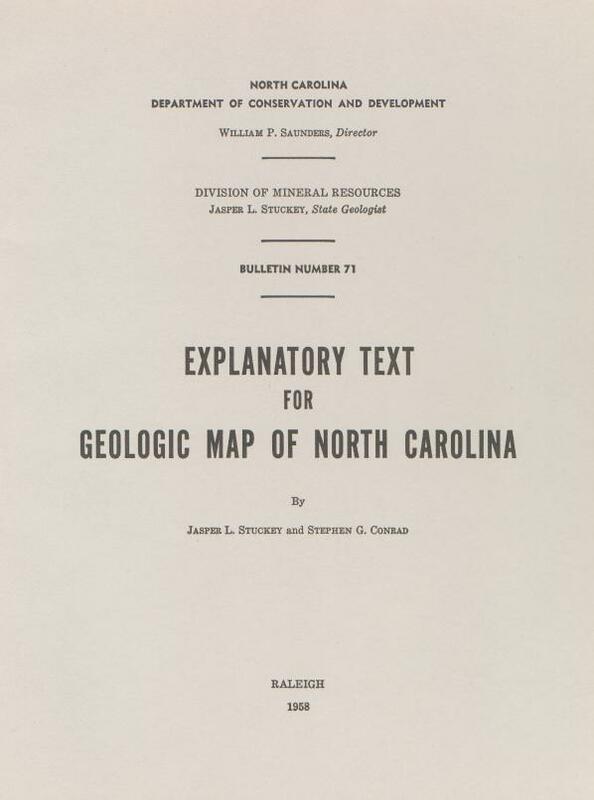 Explanatory text for the 1958 geologic map of North Carolina. North Carolina Geological Survey: Raleigh. Brown, Philip. M. 1957. Upper Cretaceous Ostracoda from North Carolina. North Carolina Geological Survey: Raleigh. Councill, R. J. 1954. 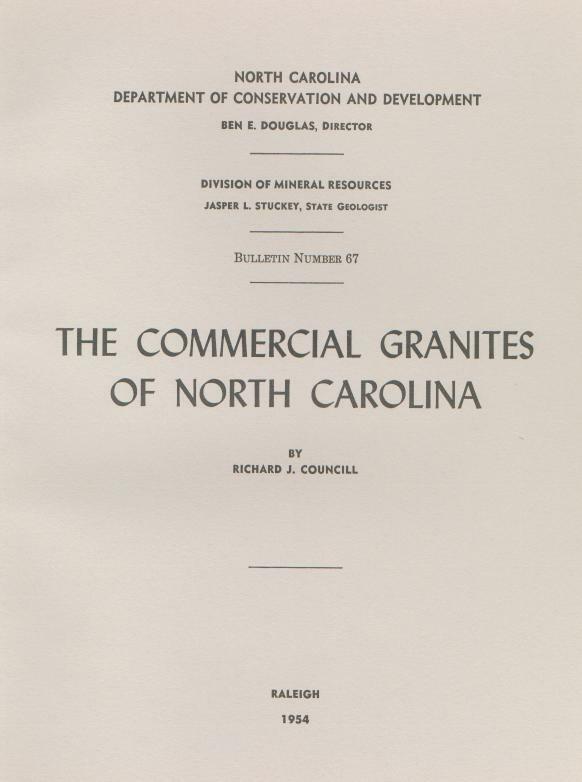 The commercial granites of North Carolina. 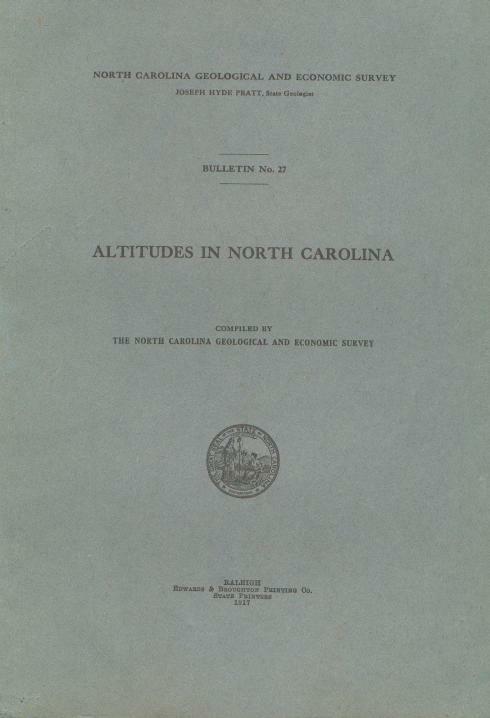 North Carolina Geological Survey: Raleigh. Broadhurst and Hash. 1953. 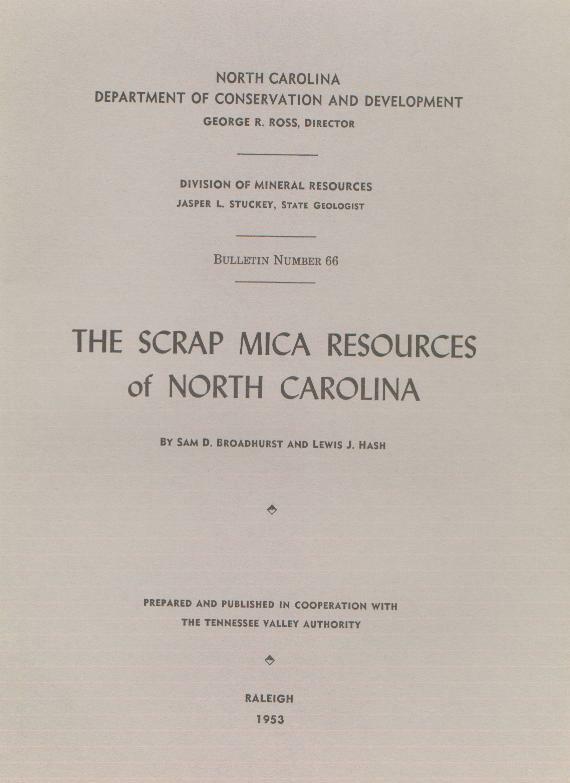 The scrap mica resources of North Carolina. North Carolina Geological Survey: Raleigh. Parker, John M. III. 1952. 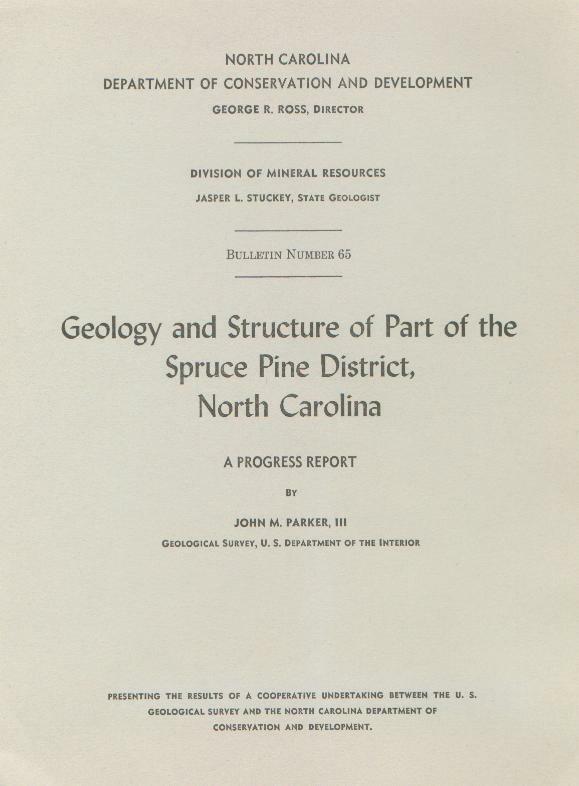 Geology and structure of part of the Spruce Pine District, North Carolina. North Carolina Geological Survey: Raleigh. Cameron, Eugene N. 1951. 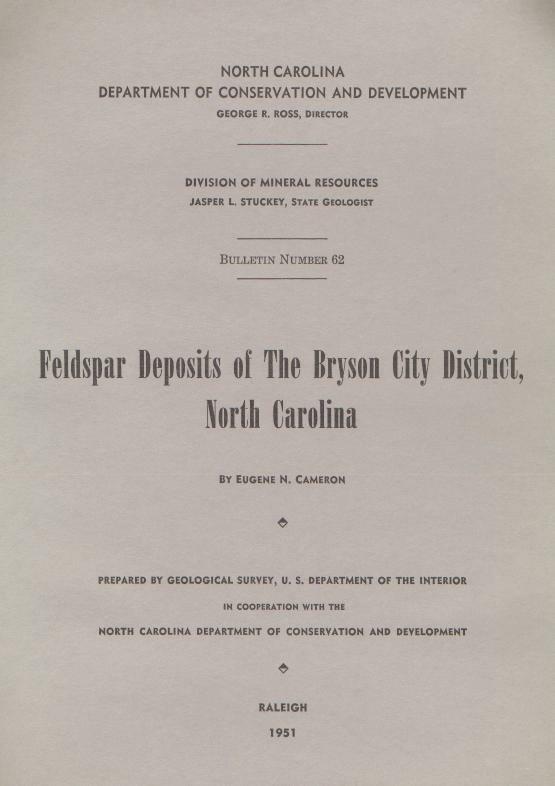 Feldspar deposits of the Bryson City District, North Carolina. North Carolina Geological Survey: Raleigh. Hash Lewis J., and Van Horn Earl C. (Teague, Kefton H., editor). 1951. 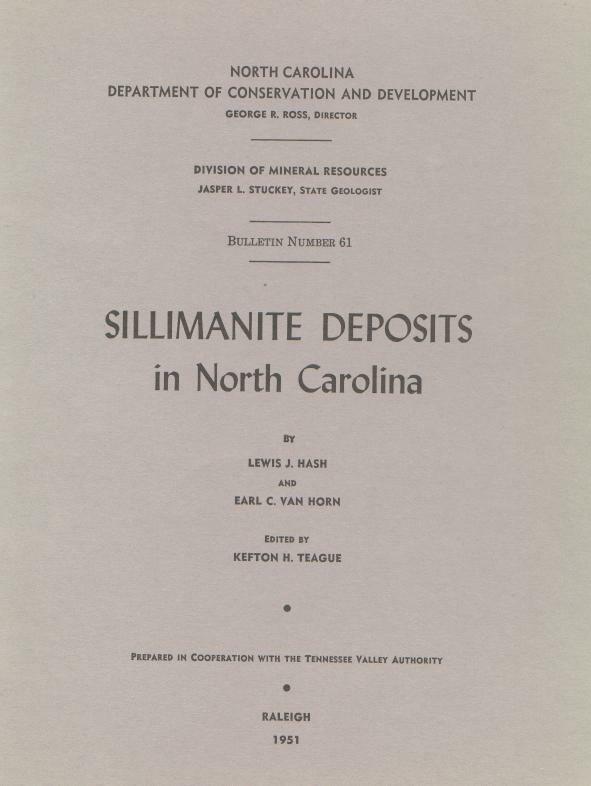 Sillimanite deposits in North Carolina. North Carolina Geological Survey: Raleigh. Van Horn, E. C., and others. 1949 (reprinted 1995). 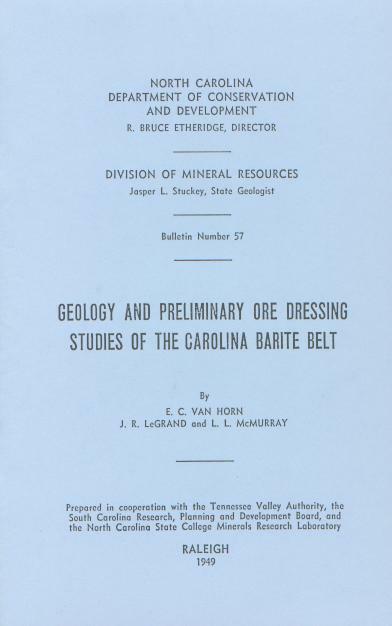 Geology and preliminary ore dressing studies of the Carolina barite belt. North Carolina Geological Survey: Raleigh. Van Horn, E. C. 1948. 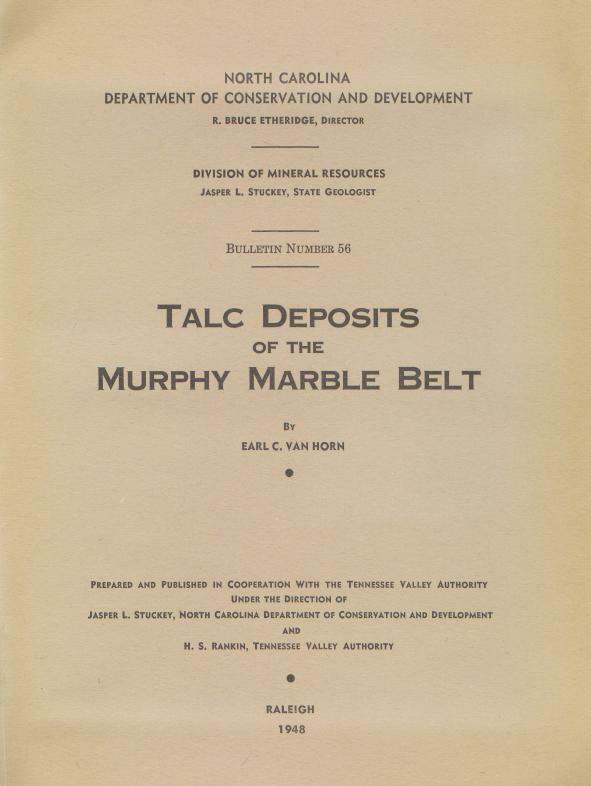 Talc deposits of the Murphy marble belt. North Carolina Geological Survey: Raleigh. Berry, E. Willard. 1948. 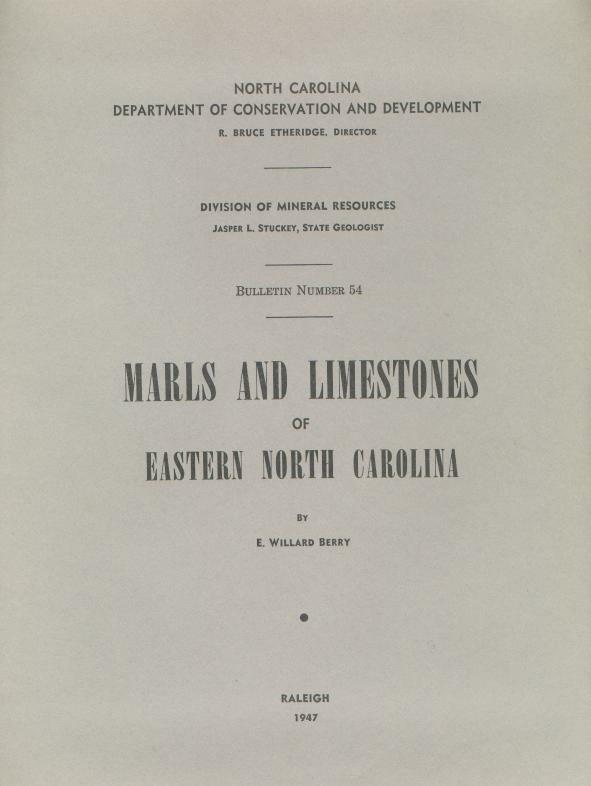 Marls and limestones of eastern North Carolina, with a geologic map of the Coastal Plain, North Carolina. North Carolina Geological Survey: Raleigh. Murdock, Thomas G. and Hunter Charles E. 1946. 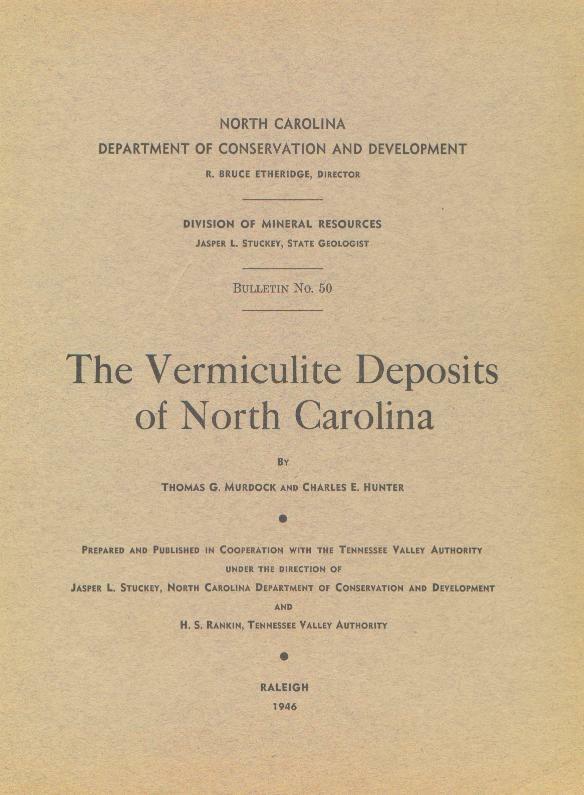 The vermiculite deposits of North Carolina. North Carolina Geological Survey: Raleigh. Olson, J. C. and others. 1946. Mica deposits of the Franklin-Sylva District, North Carolina. North Carolina Geological Survey: Raleigh. Parker, John M. III. 1946. 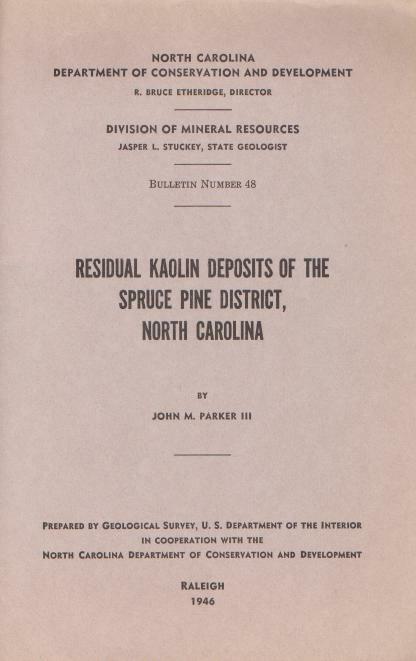 Residual kaolin deposits of the Spruce Pine district, North Carolina. North Carolina Geological Survey: Raleigh. 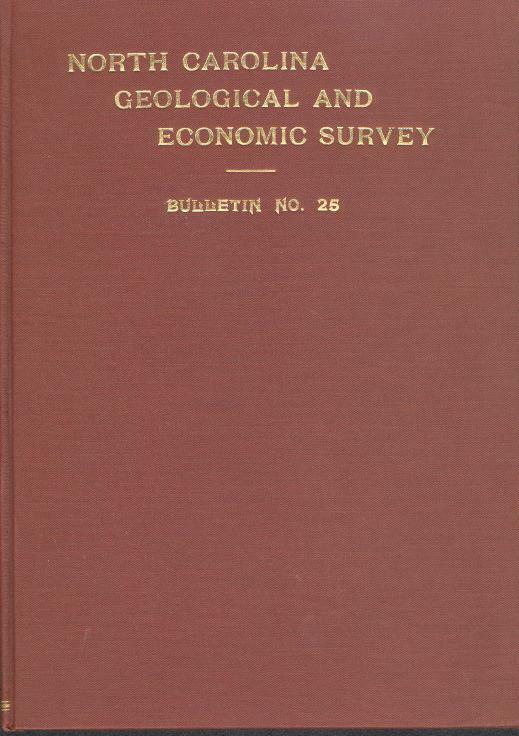 Bulletin 43 Olson, J.C. 1944. 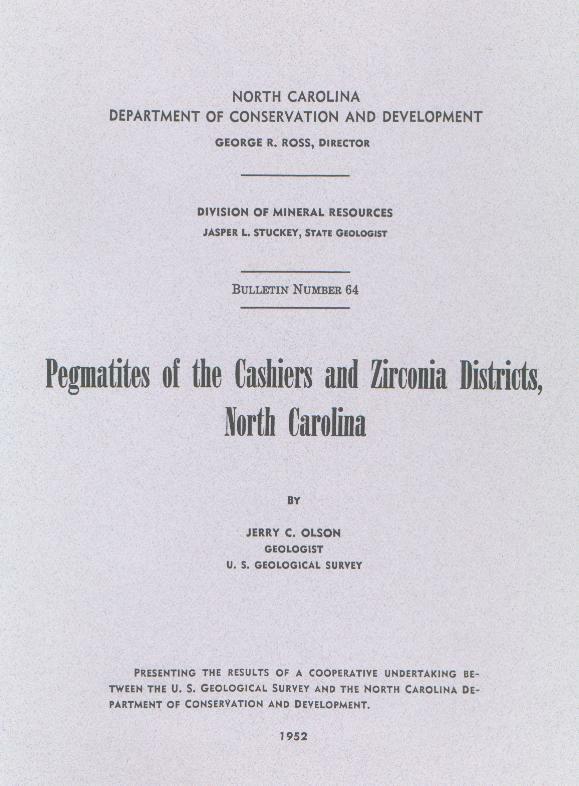 Economic geology of Spruce Pine Pegmatite district, North Carolina. North Carolina Geological Survey: Raleigh. 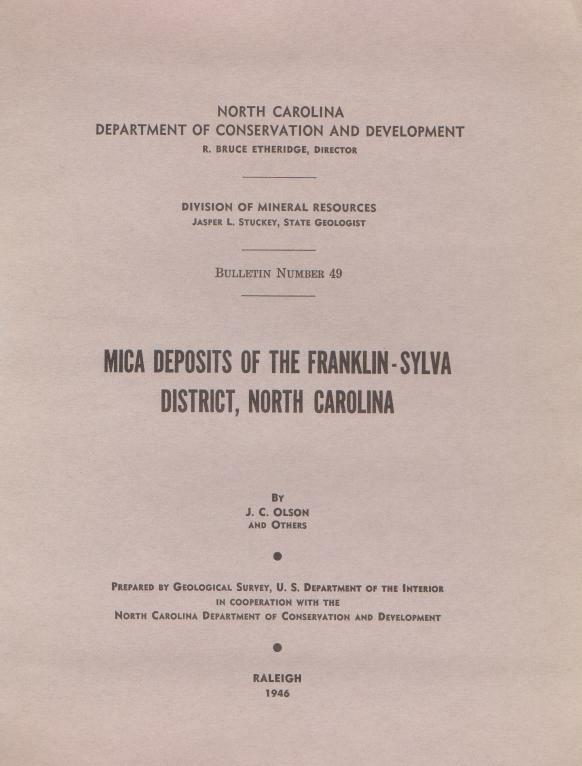 North Carolina Geological Survey, 1941. 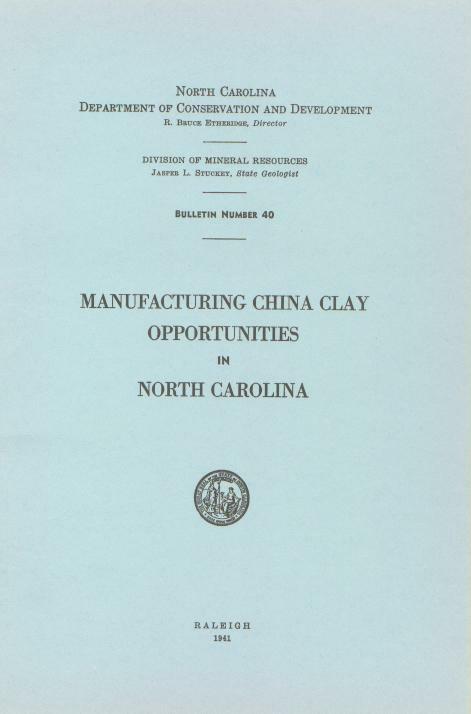 Manufacturing China Clay opportunities in North Carolina. North Carolina Geological Survey: Raleigh. Anonymous, 1917. Altitudes in North Carolina. North Carolina Geological Survey: Raleigh. Bulletin 26 See Bulletin 14: This was a joint report with Virginia Geological Survey. Same bulletin has two different entries. Laney, F.B. 1917. The geology and ore deposits of the Virgilina District of Virginia and North Carolina. North Carolina Geological Survey: Raleigh. Pratt, J.H. 1916. 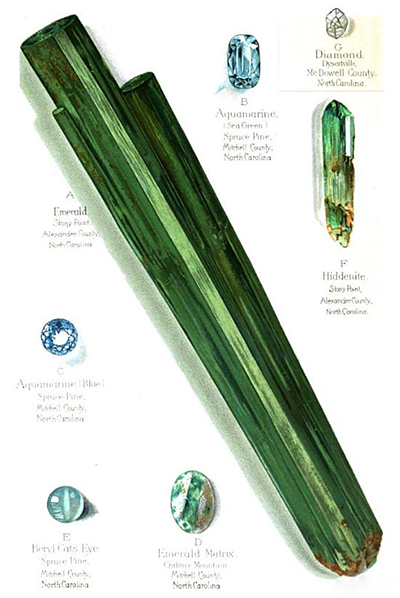 Zircon, monazite and other minerals used in the production of chemical compounds employed in the manufacture of lighting apparatus. North Carolina Geological Survey: Raleigh. Bulletin 22 Pogue, Joseph E. Jr. 1910 (reprinted, 1995). The Cid mining district, Davidson County, North Carolina. North Carolina Geological Survey: Raleigh. Bulletin 21 Laney, F.B. 1910 (reprinted, 1995). The Gold Hill Mining District of North Carolina. North Carolina Geological Survey: Raleigh. Laney, F.B., 1917 (reprinted 1995). 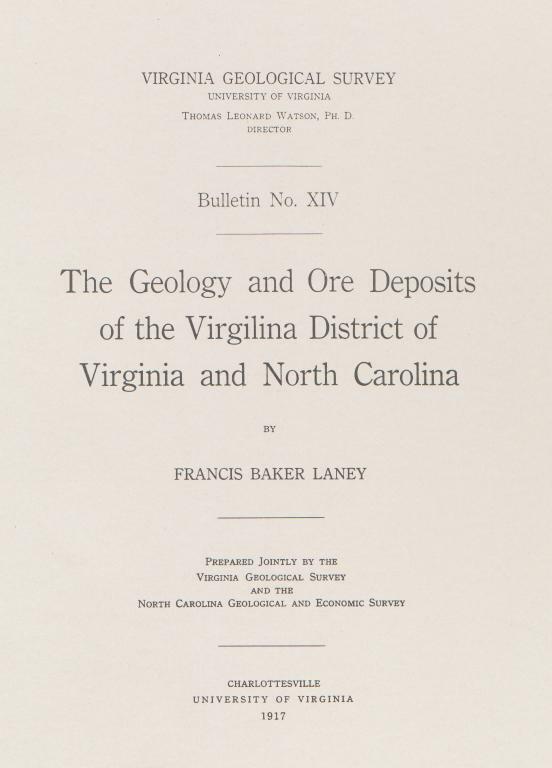 The Geology and ore deposits of the Virgilina District of Virginia and North Carolina. North Carolina Geological Survey: Raleigh. Bulletin 3 Nitze and Hanna. 1896 (reprinted, 1995). Gold deposits of North Carolina. North Carolina Geological Survey: Raleigh. Bulletin 1 Nitze, H.B.C. 1893. Iron ores of North Carolina. North Carolina Geological Survey: Raleigh.